All AEG facilities, teams, venues, and service providers, such as STAPLES Center (Los Angeles, CA), Sprint Center (Kansas City, MO), KFC Yum! Center (Louisville, KY) Oakland Alameda Coliseum (Oakland, CA), Oracle Arena (Oakland, CA), PPG Paints Arena (Pittsburgh, PA), Valley View Casino Center (San Diego, CA), PlayStation Theater (Times Square, NY), Verizon Theatre (Grand Prairie, TX), Colosseum at Caesars Palace (Las Vegas, NV), Target Center (Minneapolis, MN), StubHub Center (Carson, CA), AEG Facilities, LLC; AEG Global Partnerships, LLC; the LA Galaxy (MLS); the LA Kings (NHL), Ontario Reign (AHL), the Amgen Tour of California; AEG Presents, LLC; and others. Los Angeles, CA 90015, U.S.A.
Additional contact information is available below. Identity Data – Information such as your name; address; email address; telephone number; gender; date of birth, age and/or age range; account login details, including your user name and password, avatar, or other account-related information; information you provide in connection with your application to be a vendor, volunteer, employee, or otherwise join or support our team; your identity, public profile, and similar information from social networks such as Facebook (this may include your employment or education information if you include it in your public profile). Event Access Data – Information such as unique IDs and similar data collected or derived from the use of tickets or RFID enabled products such as wristbands, as well as location data, entrance location, entrance time, etc. relating to the use of a wristband at Events and Venues; information about your vehicle (when you use our car parks or access certain portions of Events and Venues in a vehicle). Location Data – Information about your location (for example, if you use WiFi at our Events and Venues, use GPS location in certain mobile applications, or when you provide your location in social media tags/posts we will record the dates and times of your visit and which parts of our Events and Venues you visited). Online Services Data – Information about how you use our internet-connected Services, including the pages or sections you have visited on the websites or mobile applications provided by us (including pages we control on third party platforms and social media sites), the other companies in Our Group or by our ticketing providers, the website or mobile application you were referred from, and when you visited or used them; information about electronic communications you receive from us, including whether that communication has been opened and if you have clicked on any links within that communication. Device Data – Information about electronic devices you use to access our Services (including our Services on third party social media sites, or technologies on the Services that are controlled by third party data controllers) such as make and model, device identifier, advertising identifier, operating system, browser, MAC address or IP address. Transaction Data – Information about the Services we provide to you and about transactions you make with other companies for events and services at our Events and Venues (including for example, what has been provided to you, when and where and, if applicable, how much you paid). Preferences Data – Information we receive or create about you, such as your demographics, product/service preferences, market segments, etc., information derived from social media, e.g. likes and favorites, market segments, or opinions, and data or analytics provided about you or your account by social media companies; information from market research companies who provide us with additional personal data about you and your household such as income, number of children, occupation, social grade, home ownership status, the products and services you use or intend to use or purchase, and your interests. Financial Data – Information such as bank account details, payment card information, and information from credit reference agencies. Contact Data – Information about how we can communicate with you, such as email and physical addresses, social media handles, and information you provide to us when you contact us by email or when you communicate with us via social media. Health Data – Information about your health (for example when you are buying tickets for wheelchair accessible spaces, when you request a sign language interpreter, or when we are investigating an accident which may have happened at one of our Events and Venues). Biometric Data – Images from facial recognition systems operated at Events and Venues (if any). CCTV – Recordings and images collected from our surveillance cameras when you visit Events and Venues and areas adjacent to them. User Content – Information you give us in free text fields such as comment boxes, answers you provide when you participate in sweepstakes, contests, votes and surveys, including any other personal data which you may provide through or in connection with our Services. We will receive your personal data when you provide them to us, when you purchase products and services offered via our Services, or when you otherwise use our Services. We may also collect information about any device you have used to access our Services, the websites or mobile applications of other companies in Our Group, the websites of any ticketing service provider used to purchase a ticket to our Events and Venues, or when you use WiFi at any of our Events and Venues. ad networks, behavioral advertising vendors, market research, and social media companies or similar companies who provide us with additional personal data about you and your household, demographics, preferences, etc. Service providers, such as companies providing WiFi service at our Events and Venues, or other third parties that provide services on our behalf. We generally process Identity Data, Financial Data, Transaction Data and Contact Data as necessary to perform or initiate a contract with you, process your order and payment, and carry out fulfillment and delivery. providing you with information about our Services, to contact you about administrative matters, and to manage and respond to any queries or complaints you make or any correspondence you send us. We generally process Identity Data and Event Access data as necessary to grant you access to the Events and Venues and provide the services or products you have purchased. managing access to specific areas of our Events and Venues (for example, we will use lists of people and/or vehicles to allow us to manage access to backstage or VIP areas). Note, in certain cases, we may collect Health Data or Biometric Data. Health Data is generally used so that we can provide certain services to you such as to provide you with tailored services (for example, a wheelchair accessible space or a sign language interpreter) or to help us investigate an incident which may have taken place at our Events and Venues. Biometric Data may be used for access control, creating aggregate data, personalization, or other commercial purposes. In each case, where consent is required by law, we will process this information only with appropriate consent. We generally process Device Data as necessary to initiate or fulfill your requests for certain features or functions through our Services, such as keeping you logged in, delivering pages, etc. analyzing the use of our Services, including navigation patterns, clicks, etc. to help understand and make improvements to the Services. We process Identity Data, Contact Data, and User Content as necessary to process your request to enter the contest, or take part in a promotion, notify you if you have won or to process delivery of a prize or for other related purposes. helping us to ensure our customers are genuine and to prevent fraud. Note, if you win a contest/sweepstakes, we may publicly post some of your data on our website or mobile application (for example acceptance of a prize may also require you to allow us to post publicly some of your personal data such as on a winners’ page). Where required by law, your information will not be posted without your consent. We may process any personal data we control as necessary, for our legitimate interests in providing the Services and ensuring they operate safely, securely and in a commercially suitable way, and for the good governance of our business, such as keeping business records, and analyzing the use of our Services. We may also process any personal data as necessary to comply with our legal obligations, such as where you exercise your rights under data protection law and make requests, or where we must comply with our legal obligations, lawful requests from government or law enforcement officials, and as may be required to meet national security or law enforcement requirements or prevent illegal activity. We may also process data to protect the vital interests of individuals, or on certain public interest grounds, each to the extent allowed under applicable law. when you enter a contest or other promotion. We may also process this personal data for targeted advertising. However, where consent to processing is required by law, we will link and process this information for targeted advertising only with appropriate consent. We will collect and aggregate on an anonymous basis information about you, your spending and use of our Services with information about other users of the Services in order to identify trends (“Aggregated Data”). We may pass Aggregated Data to the third parties referred to in the section below to give them a better understanding of our business and to bring you a better service. Aggregated Data will not contain information from which you may be personally identified. Consistent with our legitimate business interests, we (or if appropriate, our third party partners) may send you marketing and promotional communications if you sign up for such communications or purchase products or services from us. Where allowed, we may also send you these communications if you register for our Services or for a promotion, or in connection with your communications with, or submission of User Content to, us. These communications may be personalized or customized based on your user profile. Similarly, we may also collect device data and contact data so that we can determine whether you have opened an email or otherwise interacted with our communications, and we may generate preferences data based on these interactions. We or other companies in Our Group will combine any personal data about you that we receive from you, from other companies in Our Group, and from third-parties in order to create marketing profiles. Marketing profiles include personal data such as information about Services you have used or purchased previously, information about when you have visited our Events and Venues in the past and which parts of the building you visited or events you attended, demographic data and data from your social media profiles. For example, we may analyze the personal data of people who have purchased tickets for a particular future event that we promote, operate, provide services for, or that is hosted at one of our Events and Venues, and then compare them with other people in our database. If we identify people in our database who have similar personal data to the original purchasers, we may then target marketing about that event to the new people we have identified in our database, for example by sending direct marketing emails. We may conduct the profiling and send the direct marketing emails automatically. Our Group, and certain third parties operating on or through our Services, may engage in targeted advertising. This form of advertising includes various parties and services providers, including third party data controllers, engaged in the processing of personal data in connection with advertising. These parties may be able to identify you across sites, devices, and over time. The parties that control the processing of personal data for behavioral advertising purposes may create or leverage information derived from personalization and profiling. In some cases, these parties may also develop and assess aspects of a profile about you to determine whether you are a type of person a company wants to advertise to, and determine whether and how ads you see are effective. These third parties may augment your profile with demographic and other preferences data derived from these observations, and may also track whether you view, interact with, or how often you have seen an ad, or whether you complete a purchase for a good or services you were shown in an advertisement. We generally use targeted advertising for the purpose of marketing our Services and third party goods and services, to send marketing communications, including by creating custom marketing audiences on third-party websites (such as Facebook). In order to streamline certain business operations, improve Service personalization and behavioral marketing, develop products and services that better meet the interests and needs of our customers, and promote information we believe will be of interest to you, we will share your personal data with other companies in Our Group, as well as any other current or future affiliated entities, subsidiaries, and parent companies of AEG. In connection with our general business operations, product/service improvements, to enable certain features, and in connection with our other legitimate business interests, we may share your personal data with service providers who provide certain services or process data on our behalf. In order to improve personalization, deliver more relevant advertisements, and develop better products and services, we may share certain personal data with current or future affiliated entities and trusted third parties for marketing, advertising, or other commercial purposes, and we may allow third parties (such as Facebook and social media advertisers, ad exchanges, data management platforms, or ad servers) to operate on our Services and process data for behavioral advertising. Where allowed by law, or with your consent, we will share your personal data with other trusted third parties, for example the artists, promoters or sponsors we work with. In certain cases, these parties may use your personal data for marketing or promotional purposes by sending you information about related products or services that may be of interest to you. If you use any social media plugin, API, or other similar feature, use an event hashtag or similar link, or otherwise interact with us or our Services via social media, we may make your post available on our Services or to the general public. We may share, rebroadcast, or redisplay personal data or other information in the post to the extent permitted by the relevant social media service. to protect the rights, property, or safety of Our Group, our customers or other persons. This may include exchanging personal data with other organizations for the purposes of fraud protection and credit risk reduction. If you are located outside the US, your personal data may be transferred to and/or processed in a location outside of the European Economic Area (EEA). In particular, your personal data may also be processed by staff operating in the United States or outside the EEA working for us, other members of Our Group or third-party data processors. Such staff may be engaged in, among other things, the provision of our Services to you, the processing of transactions and/or the provision of support services. We retain information for so long as it, in our discretion, remains relevant to its purpose, and in any event, for so long as is required by law. We will review retention periods periodically, and may sometimes pseudonymize or anonymize data held for longer periods, if appropriate. However, in some circumstances we will retain your personal data for a shorter period, such as CCTV footage, which will be retained as required by law. Similarly, we will retain your personal data for longer if we believe we may need them in order to respond to any claims, to protect our rights or the rights of a third party, and we will retain your personal data for longer if we are required to retain them in order to comply with applicable laws. We will always retain your personal data in accordance with data protection law and never retain your personal data for longer than is necessary. object to us processing your personal data for direct marketing purposes. Your request must include your name, email address and postal address and we may request proof of your identity. Please allow at least seven working days for us to process your request. Residents of California (and others as required by applicable law) may request a list of personal data we have disclosed about you to third parties for direct marketing purposes during the preceding calendar year. You may submit your request by contacting us regarding “data rights requests”. Please note, we may request any additional information from you which may be required by or appropriate under applicable law to fulfill your request. Individuals under the age of 18 in California can delete or remove posts using the same deletion or removal procedures described above, or otherwise made available through the Services. If you have questions about how to remove your posts or if you would like additional assistance with deletion you can contact us. We will work to delete your information, but we cannot guarantee comprehensive removal of that content or information posted through the Services. You may control or limit location data that we collect through our Services by changing your preferences in your device’s location services preferences menu, or through your choices regarding the use of Bluetooth, WiFi, and other network interfaces you may use to interact with our Services. However, please note that use of RFID technologies may be necessary for the functioning of hardware required for certain processing of personal data. You can withdraw your consent to receive marketing communications by clicking on the unsubscribe link in an email or by adjusting the push message settings for the mobile application. You can also withdraw your consent to receive marketing communications or any other consent you have previously provided to us by contacting us using the information below. The consequence of you withdrawing consent might be that we cannot perform certain services for you, such as location based services, the availability of personalized services or relevant advertising, or other services conditioned on your consent. You may also make a complaint to a supervisory authority for data protection matters. Complaints should be directed to the appropriate supervisory authority in your jurisdiction. Alternatively you may seek a remedy through local courts if you believe your rights have been breached. We use industry standard technical and organizational security measures to protect your personal data. We keep your personal data secure by implementing policies, procedures and access controls so that only authorized members of our staff or authorized third parties can access your personal data. We protect our information technology systems with firewalls and anti-virus and anti-malware software and other information security technology solutions. When we transfer your personal data to third parties we use encryption. We cannot guarantee the security of your personal data when you transmit it to us. For example, if you email us your personal data, you should be aware that email is not a secure transmission method. As such, you acknowledge and accept that we cannot guarantee the security of your personal data transmitted to us and that any such transmission is at your own risk. Once we have received your personal data, we will use strict procedures and security features to prevent unauthorized access. We sometimes provide you with links to other websites or mobile applications, but these websites and mobile applications are not under our control. We are only responsible for the privacy practices and security of our Services. We are not responsible for the privacy policies, content or security of any linked websites or mobile applications. We recommend that you check the privacy and security policies of each and every website and mobile application that you visit. to allow us to carry out retargeting (this includes, for example, when advertisements are presented to you for products or services which you have previously looked at on a website, but have not purchased). Our Services are neither directed at nor intended for use by children under the age of 13 in the US, or under the age of 13 to 16 in the EU, depending on the local jurisdiction. We do not knowingly collect personal data from such individuals. If we learn that we have inadvertently done so, we will promptly delete it. Do not access or use the Services if you are not of the age of majority in your jurisdiction unless you have the consent of your parent or guardian. Feel free to contact us with questions or concerns using the appropriate address below. 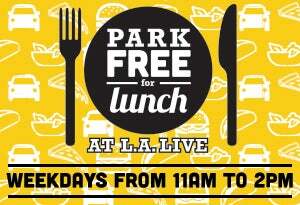 Enjoy your lunch at L.A. LIVE and receive free parking on us! 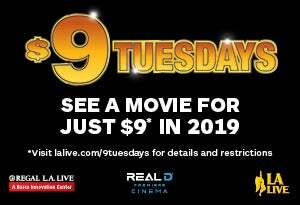 $9 movies at Regal L.A. LIVE: A Barco Innovation Center every Tuesday! Happy Hour at L.A. LIVE! 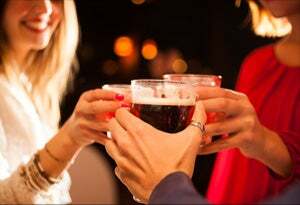 Find the best Happy Hours for that after work drink!